Laura Jackson is a self-proclaimed foodie with food being a central part of her life and family traditions for as long as she can remember. Her passion for sharing her food creations begun at the age of 9, selling homemade slush puppies to neighbours during a hot summer. Laura sold fudge at food exhibitions during her time at university, and her first job as a graduate “in the real world” was traversing the streets of London and ‘cold calling’ face-to-face in restaurants and cafes selling iced coffee (during what turned out to be one of the wettest summers on record!). 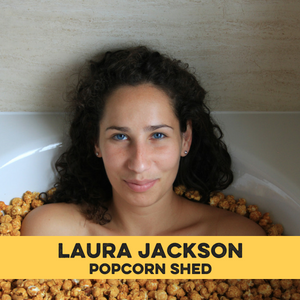 At Popcorn Shed, Laura heads up the sales and marketing team. She has a keen eye for great design and detail. Laura will be part of our panel on "How to seedfund your business" in the Shoptalk room on Thursday. Get your tickets here.